I normally like to take the weekend before Tout Wars and hide in the man cave here at home and complete a strategy for the auction. I complete an overall budget for the draft, decide how much I want to spend on hitting and pitching, and then budget money for each of the 23 roster spots. I then take those amounts and assign at least three names to each spot to then begin to assemble a path toward the statisical targets I hope to achieve during the auction. That was the plan again this year, until my wife’s unexpected appendicitis struck on a week ago Wednesday. That resulted in a canceled business trip, and me going to Raleigh over the weekend to carry around dance bags and luggage for a dance competition as my wife was restricted to llfting anything more than a glass of wine. That left me with a choice: functioning on two hours of sleep for the remaining nights until Tout Wars or going in and trusting my knowledge, numbers, and skills to assemble a roster? I opted for the latter, even though I did wake up at 2am Saturday morning in a panic because I thought I had overslept and then could not go back to sleep. I’ve obviously already lost Michael Fulmer for the year, and that’s fine. I knew he was not 100 percent on draft day, but was treating him like Andrew Heaney last year, who was also hurt to begin the year but ended up doing alright. I’m not going to get a pitch out of Fulmer this year, but I will now get $40 in FAAB back when I cash him in, which is a nice benefit given I start the season with $10 fewer dollars than the $1000 most have because I finished at 59 points last year. In Tout Wars, you lose $10 for every point you finish below 60. I’ll need Marco Estrada for now, and thankfully he is not pitching in the Tokyo Dome again this season. Kyle Seager was rostered under the impression he was going to be out six weeks rather than the 10-12 weeks everyone else knew about. That was a bit of news that I missed in the final days leading up to Saturday morning, but I should still get 16 weeks out of Seager once he returns and can stash him on the disabled list. That said, I would have liked to repurpose the $8 combined on these guys for something else. They were the 197th and 217th players nominated for auction. Pitchers that went after Fulmer for $4 or less I could have grabbed include Forrest Whitley, Matt Shoemaker, Yonny Chirinos, and Justus Sheffield. For Seager, it could have been Eduardo Nunez or early AL MVP leader Tim Beckham. We had to go through the painful exercise of rostering 24 catchers in this auction. Three of them went for double digits: Gary Sanchez at $25, Danny Jansen at $14, and Robinson Chirinos at $12. I rostered the 11th and 12th catchers nominated in the aution, and I believe I nominated both of them. I went with Vazquez because of the lineup that he is in, and that his expected batting average was 44 points better than his actual average last year. Yes, Tout is an OBP league, but more hits means more times on base for a guy that rarely walks. Sisco should play a fair amount for a terrible Baltimore team and showed OBP chops in the minors, but has shown next to nothing at the big league level in just over 200 plate appeaances. Gallo was the 67th player nominated for bid, and power had not come cheaply in earlier bids. He was one of five players (Stanton, Davis, Judge, Martinez) that I had projected for 40 homers, and those other guys went 29, 25, 33, and 33 respectively. Gallo and Davis are rather similar players in production with Gallo both walking and striking out more than Davis. I did like the fact Gallo had dual eligibility at first and the outfield, as having a few players like that in a single league is a nice bonus when you are looking to find free agents during the season. I’ve already talked about how Seager ended up on the roster, but not Austin. Austin was my final bid of the auction, and I threw him out with my remaining dollar. Had I known I could have gotten Tim Beckham and his roster flexibility for $1 later, as Nando DiFino did, I would have waited. Austin may not have a job in Minnesota, but as I pointed out in last week’s Collette Calls column, his bat shows potential when he can manage to make contact. I rostered lots of flexibility here by design. I like what I’ve seen from Niko Goodrum this spring, and he qualifies at second, first, and the outfield this season. He is going to hit toward the middle of the Detroit lineup, but the position is up in the air. Josh Harrison gobbled up the starting job at second base, Miguel Cabrera is literally anchored on first base, so Goodrum is left to serve as DH, or should be in the outfield to allow Nicholas Castellanos to function there until he is traded this season. Pinder also has flexibility as he qualifies at second, third, and the outfield. He is already hitting in the middle of the Oakland lineup, and has been a productive hitter whith hidden upside the past couple of seasons. Pinder had the 13th-best Barrels/PA percentages last year (tied with Tyler Austin) and had the same exit velocity on line drives and flyballs as the $430 million man in 2018. He has been roughly league average against righties while raking against southpaws, but the lack of a true defensive home limits his upside. For now, the flexibility is the value as I can likely get 15 home runs out of him even if he does not get to 400 at bats. Jorge Polanco is a top-175 player. His current ADP is 212 and he is the 22nd shortstop off the board. He has gone as high as 131 in drafts and as low as 321. The obvious excitement around him is he is hitting leadoff for a rather potent top half of the Minnesota lineup and folks are hoping that 2017 was real and not all about the PEDs. The expected stats tell us that what he did in 2018 after the long layoff from suspension was real as there is nary a difference between his actual and expected outcomes. His expected stats were roughly 10 percent better than the league average. The area that can hold this back is if Polanco continues his struggles from the right side of the plate. He is a switch hitter, but has been decidedly terrible from the right side with a .280 wOBA and a 70 wRC+ (100 is league average) the last two seasons. Meanwhile, he has a .338 wOBA and a 110 wRC+ from the left side of the plate. There is much volatility at the shortstop position after you get past the top six to eight players. You do not have to reach to get Polanco, but the closer you get to pick 200, you should consider rostering him. He should get all of the leadoff assignments against righty pitchers this season, of which there are many in the American League Central. We only roster four outfielders in Tout because the fifth outfield position was converted to a swingman role where we can use an extra hitter or an extra pitcher. Everyone knew Pham was coming on my roster, and I had to pay the extra dollar as I got stuck on the even dollar bid rails. Pham made some changes to his swing once he got to Tampa Bay and was making outstanding contact down the stretch and I believe he will anchor the club’s offense this year. Delino DeShields Jr. steals 30 bases. To borrow from Bill Simmons and Matthew Berry, this is my fantasy kryptonite. I see this guy and I just cannot resist putting him on my roster no matter how terrible he is with a bat. He accepts his walks, but he strikes out quite a bit for someone with very little power, but that speed is tough to ignore! By Sprint Speed, DeShields is seventh in the league at 30.0. The only players with faster sprint speed scores in 2018 were Byron Buxton (30.5), Roman Quinn (30.2), Magneuris Sierra (30.2), Adam Engel (30.1), Billy Hamilton (30.1), and Trea Turner (30.1). DeShields can fly, and he was successful in 20 of his 24 attempts last season over 393 plate appearances. He is currently slated to hit 9th in the lineup and play center field with Nomar Mazara and Joey Gallo starting on each side of him and Willie Calhoun waiting in the wings if we are to believe this noise about Gallo playing center field. The positive part of DeShields is last year was the third year in a row he has increased his walk rate while reducing his strikeout rate. These are all positive signs, but with all of his speed, he still owns a career .244 average over 1528 major league plate appearances because he makes such bad contact. He has to rely on his legs to get most of his damage as his contact is soft, like 308th out of 313th for all qualified batters in 2018 soft. Allen was the last of the group to come up and he was at bid 191, whereas I had rostered DeShields at the 80th nomination after watching the other speedsters go at their prices. In that context, I am fine with bringing him back to my team for a third consecutive season, but it was not my intention heading into the draft. I like Greg Allen quite a bit this season, and traded for him in my home league, but he could be the first to lose his job if Bradley Zimmer returns quicker than expected or Carlos Gonzalez finds the fountain of youth. Rostering Yandy was something I looked at later in the auction since he was only going to be eligible at the Utility position on draft day. He will gain eligibility for at least one of the corner positions early in the season if not both by sometime before the summer. I maintain the Rays did not give up a player with six years of control plus send $5M to Cleveland to acquire someone they want to use in a strict platoon situation. Diaz is going to get his at bats, and he is going to get them higher in the lineup than he would had he remained in Cleveland. He looks really good in Spring Training and getting more loft and pull on the baseball (take note, Eric Hosmer, it can be done) and his real team aside, was one of my favorite buys of the auction considering his upside. This was truly an empty mindset place and I figured I would go where the prices and bargains took me. I did not buy a starting pitcher until the 37th nomination when I rostered Happ, and followed that up immediately with the purchase of Paxton. Hating Yankees is something I do as a real baseball fan, but I do not care what team a guy plays for as a fantasy player. I believe the Yankees are going to the World Series this year, and as much as that sickens me as a Rays fan, it means the Yankees are going to win a lot of games. Why not get the two guys who will front that rotation this year, and the two I like the best? I’ve long been a Paxton honk, and I feel he is in for a big year there, while Happ has been consistently good the past few years, but now gets all the spoils of an amazing lineup behind him and pitching with Death Valley over his shoulder in left center. The rest of my staff was going to be done chasing rainbows, hence grabbing Odorizzi with the hopes Rocco Baldelli does not expose him to the TTOP as much as Molitor did last year, that Pineda does not turn into Pinata again, and James turns into this year’s version of Brad Peacock for the club and is not used as sparsely as Collin McHugh was last year. The uncertainly, and the market favoring Matt Barnes, helped make Brasier affordable as well. Sure, Barnes has the electric strikeout rate and the bigger fastball, but he walks guys at twice the rate Brasier does. Barnes has saved two games in his entire professional career while Brasier saved 13 just last year in Pawtucket. Brasier has a Bob Workman feel to him, but he just may be the best person for the job. 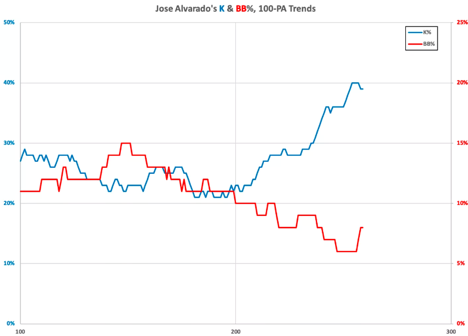 At worst, he is pitching in high leverage situations with good ratios and chances at wins and a handful of saves. The goal should be to leave the draft with your projections showing you on top. The software likes my team to finish in the top three in every pitching category while finishing in the top half of every hitting category. Obviously, I need to further adjust things for the absence of Fulmer all year and Seager for nearly half of the year, but will be active on the free agent wires looking for help at the corner if Taylor Ward does not cut it or if Daz Cameron is not recalled as quickly as I hope he will be. If Alvarado or Brasier are named the full-time guy, it gives me some quick leverage to flip a reliever for some offensive help. Here is to doing a better job of in-season management and making the final standings resemble the pre-season predictions. Jason Collette writes for the RotoWire Blog.